The Swivet: The foxes return to Brigantine! The foxes return to Brigantine! 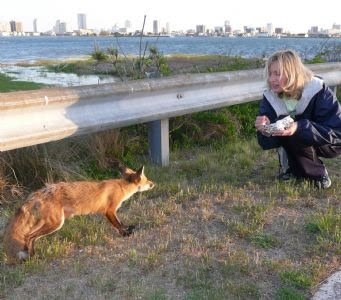 When I was about eight or nine years old, I found a red fox by the side of the road while I was walking to school. It had been hit by a car and was dying. 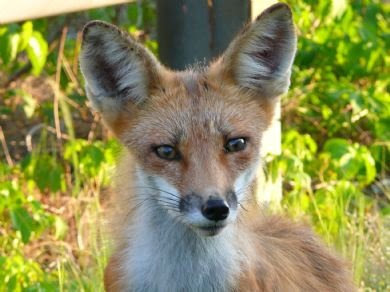 At the time, it was thought to be one of the last red foxes left on the island. That was over thirty-five years ago. It was widely assumed that the red foxes were extinct on the island. Until now. 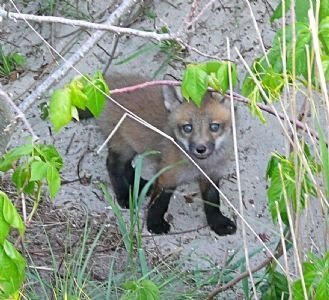 My mom sent me these photographs, taken in June of this year: a family of red foxes alive and apparently thriving on the little island of Brigantine. The most amazing thing about this is that they would have had to cross the bridge from Atlantic City to get to the island. Incredible! There are coyotes in San Francisco's Presidio. 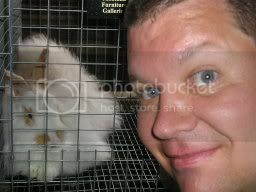 One was trapped, radio-collared and had a blood sample taken. It was thought that the blood would match the Peninsula population but it turned out to match with the Marin Headlands pop. So they must cross the Golden Gate Bridge. Now THOSE are some cute and crafty foxes. BRAVO!